But the longer I look at it, the more I realize it\'s actually beautiful. The dirt road, the weed, the road work sign, the container and most of all the reflection in the mud pool make it a perfect composition. Well, almost. Only the stray dog is missing. 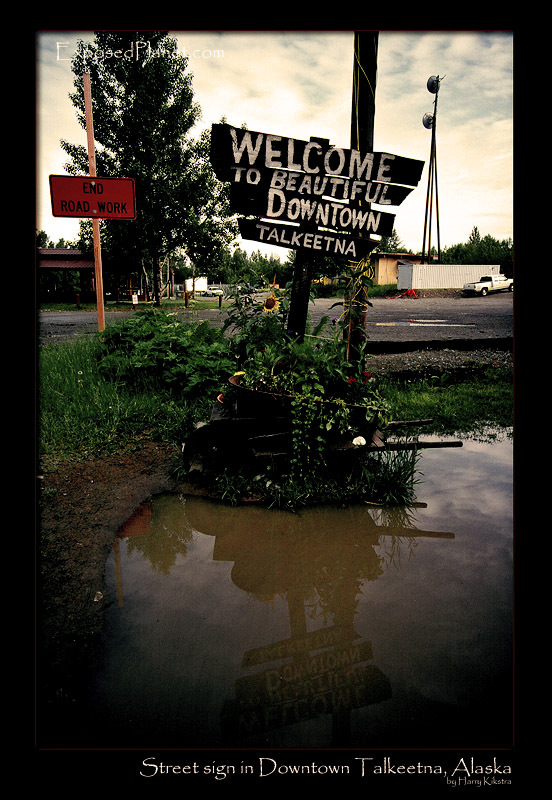 The story behind "Street sign in downtown Talkeetna, Alaska"
I guess I have to tell you that Talkeetna has less than 800 inhabitants and actually only really one street, which starts behind this sign! Fun place though with some nice bars and steakhouses and of course the Airtaxi to see or climb Denali, the highest mountain of North America. Just a little taste of the sense of humour from the Alaskans :) I guess I have to tell you that Talkeetna has less than 800 inhabitants and actually only really one street, which starts behind this sign! Fun place though with some nice bars and steakhouses and of course the Airtaxi to see or climb Denali, the highest mountain of North America.